On this date in 1945, with most land communications and electrical power lines down, Adolf Hitler broadcast on Greater German Radio the order to save his capital. The order called for Wehr¬macht forces opposing the Americans at the Elbe River to withdraw and move north to rescue Berlin, now within range of incessant Soviet artillery and Katyusha truck-mounted rocket fire. Two days later Hitler assured Gen. Helmuth Weidling, commanding the defense of Berlin, that rein­force­ments from Gen. Walther Wenck’s recently formed 12th Army and Gen. Theodor Busse’s 9th Army would deliver a crushing blow to the Bolshevik enemy. Hitler’s talk was pure fantasy and Wenck and Busse knew that. Only the night before Field Marshal Wilhelm Keitel, chief of the Supreme High Com­mand of the German Armed Forces (OKW), had left his reclusive Fuehrer in their claus­tro­pho­bic under­ground bunker and surprised Wenck at his head­quarters, 30 miles west of Berlin. Keitel told the 43-year old Wenck—the youngest man in the Wehr­macht to hold a general’s rank—that he and Busse must lift the siege and “save Hitler.” To the agitated and irra­tional Keitel, Wenck merely said okay. Wenck and Busse had nowhere near the resources to accom­plish anything but gather up the remains of their forces and, along with thou­sands of German civil­ians, retreat across the Elbe River and sur­render to the Amer­i­cans, which they did on May 7, 1945. Meanwhile, back in Berlin, the number of troops available to poor Weid­ling totaled around 80,000, barely enough to man the outer defense peri­meter. More­over about half of the capital’s defenders con­sisted of the Volks­sturm people’s mili­tia, a mot­ley, some­times dragooned cadre of teen­agers and the elderly, many of whom lacked wea­pons and even basic training. The remainder con­sisted of exhausted and demor­alized vete­rans of combat on the East­ern Front. Ranged against these makeshift formations were 1.5 million battle-hardened and well-equipped Soviet soldiers. On April 26 the capital’s defenders with­drew to within a few miles of Hitler’s bunker. The next day the German defense area shrank to less than 30 sq. miles. Hitler’s bunker was prac­ti­cally within spitting dis­tance of the Soviets. On the night of April 29–30, a frantic Hitler, still hoping to be rescued, demanded that Keitel tell him where Armee Wenck was. In his cramped sitting room hours later Hitler put a bullet through his right temple after biting down on a cya­nide cap­sule. His wife Eva lay slumped on the small blue-and-white couch to his left, a sui­cide too. Above ground nothing remained of their Thousand Year Reich. 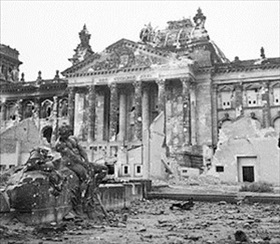 Left: The German Reichstag shows the scars of battle. Forces defending the Nazi sym­bol of power in­cluded naval, SS, and Hitler Youth per­son­nel. Many defenders held out in the building’s upper floors and cellars. It took several hours of vicious room-to-room fighting before Red Army per­son­nel secured the building. 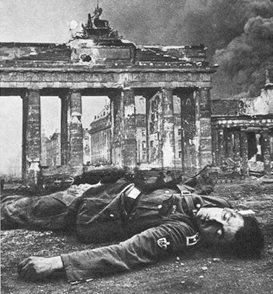 Right: A dead NCO lies close to the Branden­burg Gate while smoke rises from the near­by Reichs­tag. The badge on his sleeve in­di­cates member­ship in an un­iden­ti­fied forma­tion numbered 185. Death, devas­ta­tion, and smoke cast a pall over the Reich capi­tal that lasted for weeks. Left: Forty thousand Soviet artillery guns hammered the Nazi capital around the clock. 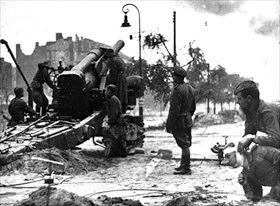 The caliber of guns the Soviets brought to bear on Berlin’s streets increased rapidly. Capable of firing one shell every two minutes, 203mm howitzers like this one had a range of 10 miles and a crew of 15. 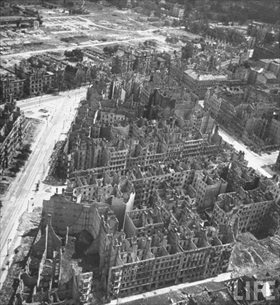 Right: An aerial photo of Berlin shows the legacy of de­struc­tion left by the war. By April 1945 Ber­lin had become a moon­scape of ruined buildings and cratered streets. 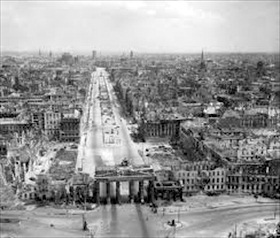 Left: Berlin’s premier street Unter den Linden in 1945 pre­sented a grim con­trast with the street’s pre­war splen­dor. View is to the east. Right: Berliners had learned to clear streets fol­lowing Allied bombing raids in the early days of the war. 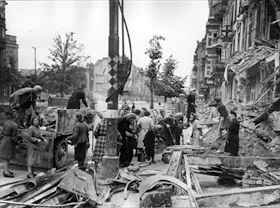 During the Bat­tle of Berlin, many streets and side­walks were turned into rubble-fields and thou­sands of citi­zens were con­scripted after­wards to make them passable.